Cruise-boats dock in the central port just a short walk to town. Neapolis (its original Greek name) was founded by the Greeks and Thracians. 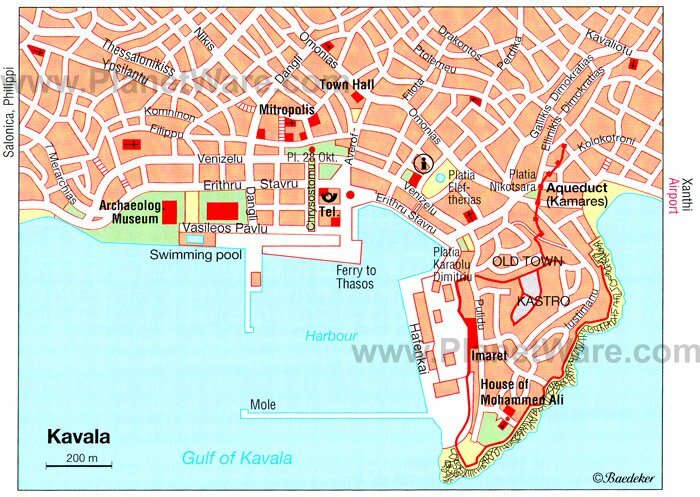 Kavala, the prefectural capital, is one of the most attractive of Greece's largest cities, rising like an amphitheater from the beautiful harbor up to a huge Byzantine fortress. Built on the ancient city of Neopolis, the cities population doubled in 1922 when the Greeks from Asia minor made there way here during the exchange of populations. The spacious squares, contemporary buildings, and shopping centers on the west side of the city form a pleasant contrast to the traditional old houses, tiny gardens and flagged alleyways of the eastern side. The harbor is particularly picturesque with its countless brightly colored fishing caiques moored along the waterfront. Among the city's impressive landmarks are the old walls, the Byzantine castle, and the Kamares - the aqueduct erected by Suleiman the Magnificent in the 16th century , Mehmet Ali's house (18th century) and the Imaret, a Turkish building. Taxis within the city are inexpensive and you should pay around 3 Euros or less for a ride to locations in the city. Taxis are metered. Ask for a receipt to ensure that you are not paying to much. Alistrati Cave, is a large cavern with organized tours where visitors can experience the wonders of gigantic stalagmites and stalactites in large underground chambers. Royal & Ancient Theatre of Philippi: Alexander the Great's father established a city at Philippito protect the goldmines that were nearby. Architectural elements can be seen at the Philippi Archaeological Museum and on the acropolis. The Greek Theater is still used for performances.